In 2012, local craft beer expert Jake Nunes was the bar manager for Stone Brewing when he was contacted on Twitter by someone at San Diego State University doing research on potentially starting a craft beer education program. 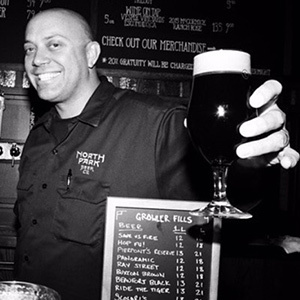 That someone was Program Director Giana Rodriguez, who noticed in Nune’s Twitter profile that he was a Certified Cicerone — one of the only ones in San Diego at the time. Nunes answered some question about his education, career, experience in SDSU’s Business of Craft Beer program, and his overall enthusiasm for craft brew. Please give us a brief overview of your education and career. I was born and raised in San Diego. I went to elementary and high school here, then became a student at San Diego State majoring in Liberal Studies. While I was in college, I was working as a bartender on the side. I became really interested in what I was pouring. Wine and spirits were my original interests. When my interest in beer started to grow, the local beer industry in San Diego was starting to bloom. It was great timing and my interest turned into a passion. I wanted to try all the beers I could and learn as much as I could about them. I have been working in the food and beverage industry for 24 years now. My first craft beer industry job started 15 years ago. I have worked for the top four largest local beer producers in a leadership position. I have trained, managed, and instructed hundreds of people working for craft beer companies. I have made a name for myself as a leader in the San Diego beer landscape. What was your first foray into San Diego’s craft beer industry? I was bartending nights at a bar in Mission Valley in 2003 when I got a second job waiting tables during busy lunch shifts at Karl Strauss in Sorrento Valley. I was already a budding beer nerd, and I entered my position as “a guy who knew his stuff” when it came to beer. This was just before the big craft beer boom, so good beer was hard to find in San Diego. The access to great, fresh beer and beer knowledge at Karl Straus was awesome! Their culture of educating the staff every day at pre-shift meetings really impressed me. I knew at that moment, I wanted to model my future around working for beer companies. You were one of the first to complete the Advanced Cicerone exam. Tell us about that. I have been a Certified Cicerone since 2011. The program was only three years old at the time. Since then, it has become the most well-known and reputable beer knowledge certification program worldwide. For years, there were only three levels of certification available. Certified Beer Server (level 1), Certified Cicerone (level 2), and Master Cicerone (level 3). Eventually, it became apparent that there was a need to bridge the gap between level 2 and level 3, so in 2016 the Advanced Cicerone certification was introduced. I signed up immediately and was selected to be in the first group of participants in the exam. I studied intensively for months with some other Cicerones in San Diego (Jenny Mann from Ballast Point, Kelly Legan from North Park Beer Co., and Morgan Tenwick and Elizabeth Mandala from Modern Times). It was an 8-hour exam with a lunch break. Very intense! Tasting, essays, interviews … it was by far the most difficult test I’ve ever taken. Months later, I received my results. I was 16 points away from a passing score. Morgan was the only one in our group to pass. She is brilliant, so no surprise there. I haven’t made a plan to retake the exam yet. Maybe someday. What do you think is a key strength of SDSU’s Business of Craft Beer program? One of the biggest strengths of the program is that the instructors are industry experts in one of the greatest beer cities in the world! They have real-world experience and proven ability in this exciting and rapidly growing industry. Tell us a bit about your course, Beer Styles II. In Beer Styles 2, the students have guided tasting lessons on specific beer styles. After the program’s inception, we quickly learned that one Beer Styles class wasn’t enough to cover everything. In BS2, we cover some styles that weren’t covered in the first class. The favorite styles we cover are usually the IPA variants and Winter Warmers like Scotch Ales and Barleywines. We also cover off-flavors, quality appraisal, and comparing similar styles. We also cover some other fermented beverages like mead, cider, and gluten-free beers. Many people with celiac disease visit local breweries and beer bars, but can’t drink anything made with barley, wheat, or rye which are the main ingredients in most beers. Having options for these people is imperative. Cider is becoming especially popular lately. Are all off-flavors necessarily accidental? Some flavors that are considered “off” in most styles can be accepted and even desired in other styles. Diacetyl smells and tastes like butterscotch, which isn’t exactly disgusting, but it may not be what you’re looking for. Many of the off flavors develop as a normal part of the beer-making process. In well-made beers, the off flavors are diminished or removed with good sanitation and thorough processes. In most cases, off flavors are detected from dirty beer lines in bars that don’t maintain their draft system well enough. Do you have a favorite off-flavor descriptor? I like to describe musty beers as having a “Pirates of the Caribbean water” aroma. Do you have a favorite anecdote or two that you tell students about either a craft beer success or fail? Whenever someone tells me that they don’t like beer, I tell them that they just haven’t tried a beer they like YET. There are so many different types of beer styles, I really feel that there is something for everyone. I always take it as a challenge to find someone’s new favorite beer. What kind of homework can students expect? Hitting the town and trying new beers! Learning to evaluate beer. We also investigate trends and hot topics in the industry. Does the course involve group activities or guest speakers? Almost all of the work in class is done in small groups. I feel that you learn much more in discussion with peers. We often have guest speakers talk about their beer in detail when we cover a style they are known for doing well. In my last class, we had Dan Drayne from Half Door Brewing talk about New England-style IPAs. When did you have your first sip of beer, what was it, and what did you think? My very first sip? My Dad let me try his Dos Equis amber. Ha ha! I didn’t hate it. I remember my first sip of Sierra Nevada Pale Ale and thinking it was too bitter! Nowadays, I can’t get enough hops! When did your love of craft beer begin? Stone IPA and Ruination made me fall in love with hops. I used to go to Pizza Port in Solana Beach back in the day. I loved everything I tried. I made it a point to get a new beer every time I visited. I think my first brewery tour was Boston Beer Co. (Sam Adams) in Boston maybe 20 years ago? I loved seeing how passionate the staff was and smelling all of the good smells in the brewery. Originally, I wanted to teach elementary school. I thought second grade would be the best. When I chose the beer industry instead, I still had the desire to teach people. I’m glad that I found both of my passions in this program. I appreciate the opportunity to teach people about beer.